Right here goes. Anton met me at my place to drop off some handlebars (thanks!) and we then met Maverick at the Dartford crossing. A little later than planned :oops: Met Faantjie at the Fleet Services and stopped to give our backsides a bit of a rest and get some much needed caffeine and nicotine into our system. Had a nice chat with some of the guys. Unfortunately some of them couldn't join us but it's always good to meet up. So we set off with Bob in the lead. I was really looking forward to riding on the plains with my KLR as I'm quite anxious to find out whether it'll be good enough for the planned trip next year through Kaokoland in Namibia. Unfortunately my new (for me) pegs hadn't arrived yet so I was a bit wary of the KLR's rubber pegs but I thought it wouldn't be too much of a problem since I was expecting the Plains to be pretty dry. 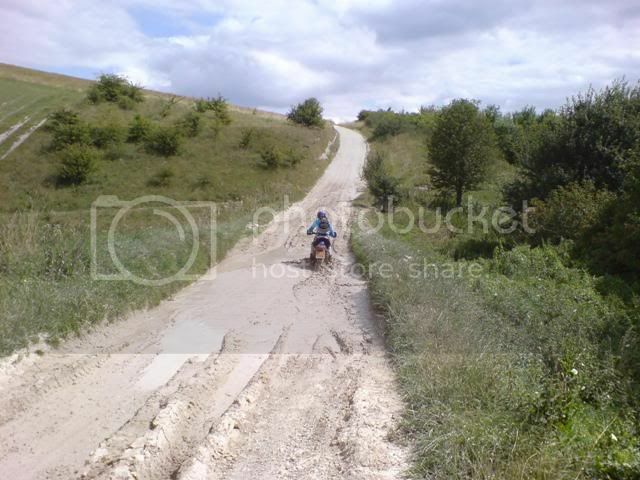 Anyway, we get to the first lane and I really chuffed with the KLR. I'd fitted Yen's old AT handlebars so it's very comfortable to stand on the pegs. About half a mile further I go over this little bump and when I came down I realised that my right foot is not on the peg. 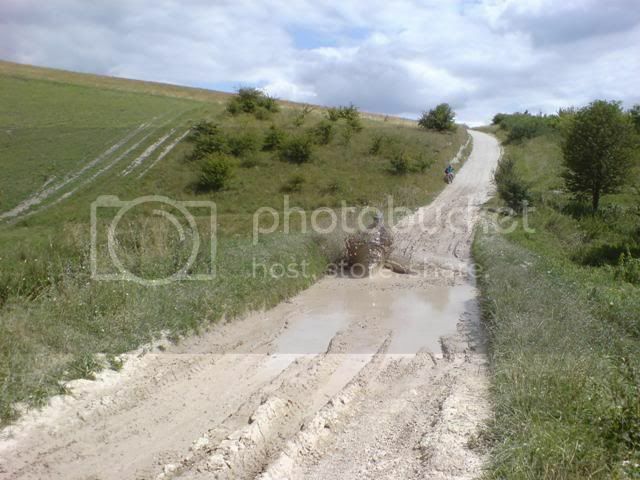 This leads to some seriously scary moments as I battle across some rough terrain whilst sat down and desperately clinging to the bike and trying to put my foot on the peg so I can stamp on the rear brake as I'm heading straight for a muddy patch with some trees right behind them. I can't find the peg but fortunately manage to keep the bike upright through the mud which slows the bike down sufficiently for me to turn the bike so I don't smash into the trees. At this stage I'm seriously cursing the guy I bought the pegs off as this is the exact reason why I didn't want to go riding with the rubbers KLR pegs. I look down and realise that my foot peg and hanger is missing. Bugger!! I've just done 120 miles to come ride off-road only to have the bike break within the first mile. Anyway, after some serious head scratching we salvage some bolts off Maverick's bike. Unfortunately they're too long but I figured that they'd be alright as long as I don't stand on the pegs. The rest of the day I was a bit frustrating for me as I didn't want to stand on the pegs but I was also aware that the KLR's subframe bolts aren't the strongest. So there I was bouncing around with feet slipping on the rubber pegs waiting for the subframe bolts to break. 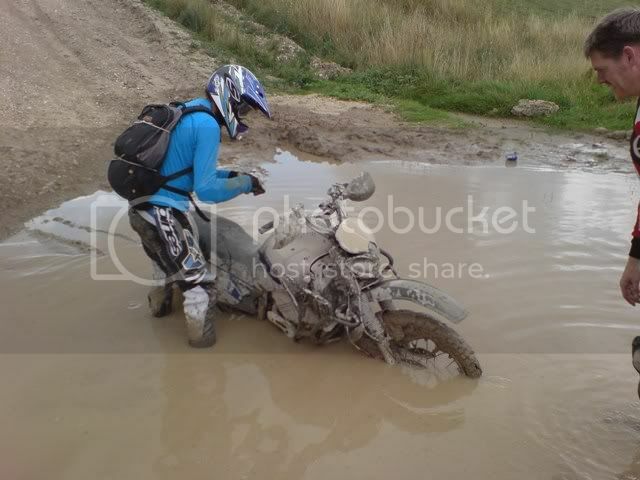 Did have some fun in a puddle where I got stuck and had trouble starting the bike again. 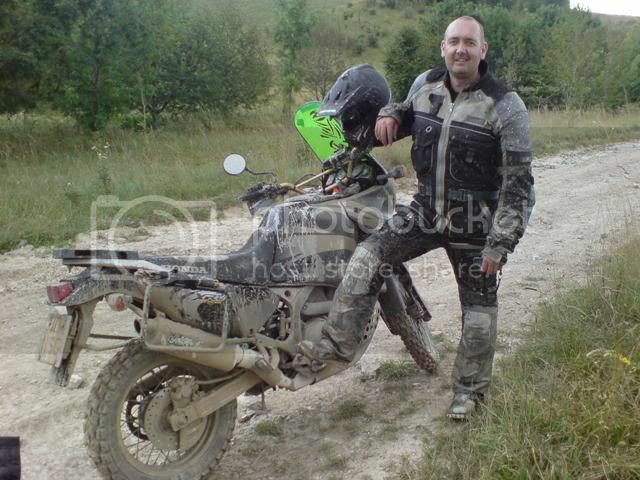 Shortly afterwards the KLR was called upon to drag Mudwiz's TA out of a seriously deep hole, which it did very well. 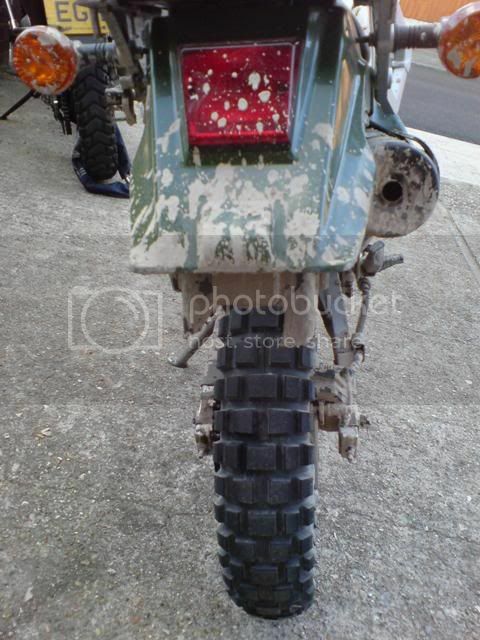 The KLR did have one more trick up it's sleeve - the rear tyre ripped off the number plate when the suspension bottomed out after a particularly heavy landing. Fortunately Maverick noticed and rode back to pick up the plate. Thanks Bro! No way you're riding the bike out of that one Mudwiz. All hands to deck as we replaced Mudwiz's front tyre. This is how you squeeze 5 bikes into a single parking space. 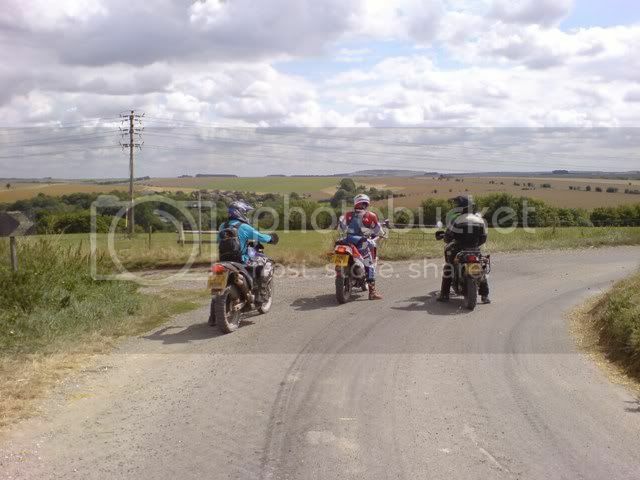 Just before the end of the day I dropped the bike when we were riding in some ruts. Fortunately I managed to step off and had a bit of a jog through the field, so no damage to either myself or the bike. Just had some trouble finding the bike in the grass. I learned some serious lessens today. The most important thing being that I will have to invest in about 1liter of loc-tite and apply that to every single bolt on the KLR. Still, better to learn that lesson now than in the Kaokoland. Thanks guys, though I didn't enjoy the ride all that much I have absolutely no complaint about the company :thumbright: Anton, apologies for leaving without waving goodbye. I was almost in tears at that stage - the KLR's seat is no better than the AT's and had to battle across about 7 lanes of traffic to get to the left-hand side tunnel. Glad to see you got back in one piece. So Lootch - why the KLR and no AT anymore? Did I miss that explained somewhere? Lekker guys! Now that is the way to see waht your bike is capable off and what mods might be needed for your Namibian trip. Lekker mud on those roads. Your bikes always seems dirtier than the SA bikes, that "white" mud. 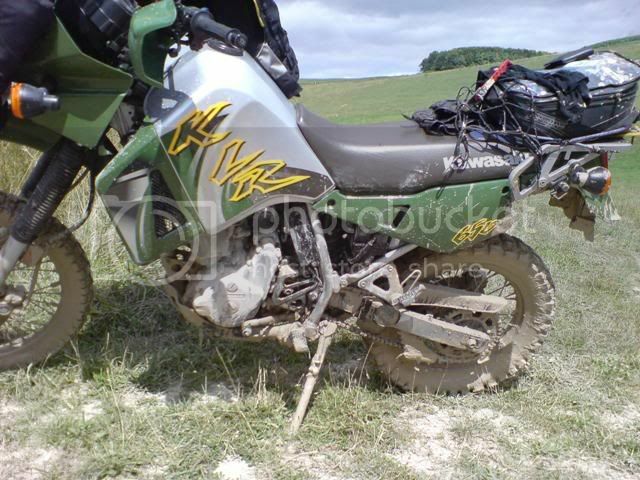 Good going on the KLR... it looks like you had a real adventure... that's what it's all about. 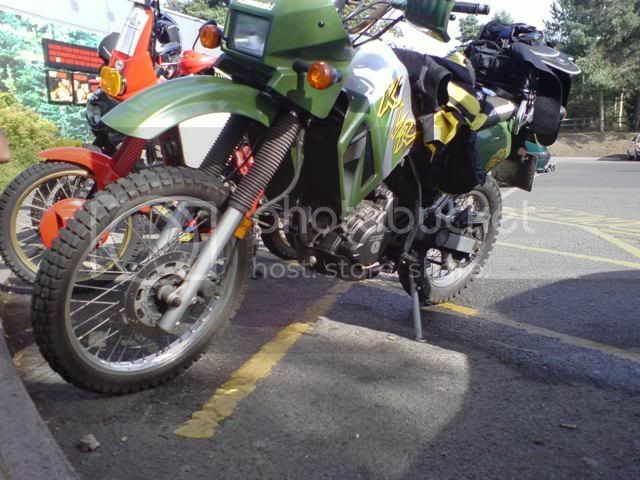 The KLR has its own personality, loctite is a must and why do you think my bike has number plate on at this moment. It happens. Look at LouisXanders bike to see the most common way of mounting the plate securely. Sweet tyres, very capable when tuned for your liking. Ooops, even mounting it there has its problems, although I think this was not offroad breakage, more like being driven into by a cage. hehe. What's that orange bike (dommie) in the second pic? Makes me think of one of characters of that animated space adventures by the creator of The Simpsons! I've still got the AT. 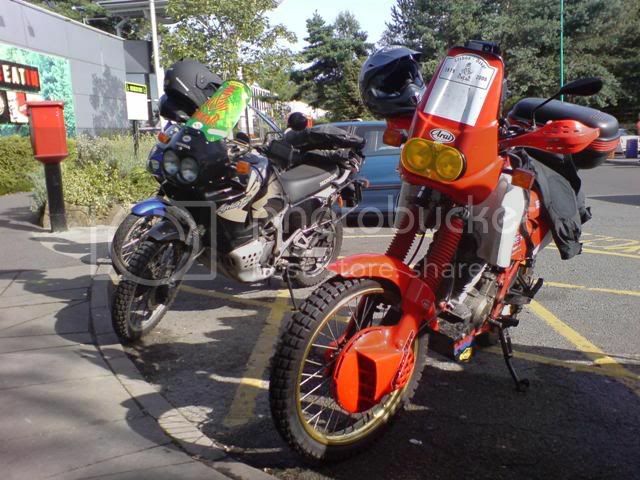 I bought the KLR for next to nothing - Ã?Â£1200 (when the exchange rate was much better than what it is now). It was first registered in 2004 and had 6,400kms on the clock. Figured it'll be worthwile to ship the bike to Namibia (after prepping/testing it here). The clutch cover needs to be replaced though which I can do myself. I would definitely have enjoyed yesterday's outing more if I'd been on the AT, but then again, having to find out about the bolts coming loose by itself when you're in the middle of nowhere would have been even less fun. Sharky, I was thinking of mounting the plate where you did. I'll try and stay clear of the cages though. Very nice Lootch. Mav!!!! What the hell happened to your hair? Did you pay for that haircut? If you did, you need a refund!! seems like mav always appreciates the mud, the golem. kilersa and i were talking the weekend about that type of green on the klr - that's what i would want if i were to invest in a klr! cool report. Mav looked like a little kid after playing in the mud. I'm kinda looking forward to our first rain. Roads should be "interesting"
Forget the roads, come play on the canal routes, 100 km,s of clay snot will work up an appetite and a thirst. hehe. Fun is all I can say. Fun and laugther. Lootch gives me a call just after 7:00 saying they are going to be a little late as Anton is dropping some spares at his place. Waiting just after the toll booths at Dartford looking at the one sports bike after the other flying through on their way to Brands Hatch as it was the super bike races or something. 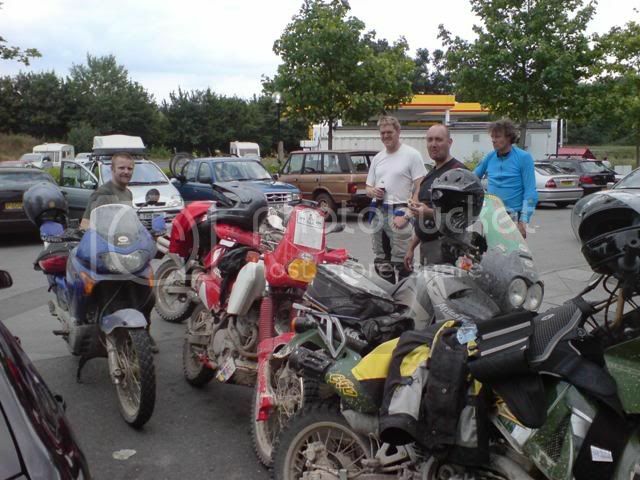 We stop at Fleet service station on the M3 waiting for Fanus and having a quick cup of coffee. There I was thinking we should head out early so that we can leisurely cruise with the KLR and Dommie only to find Lootch leading us at a very steady pace ahead. The Dominator, Anton did some wicked mods on his bike and it has the Africa Queens fairing in the front. 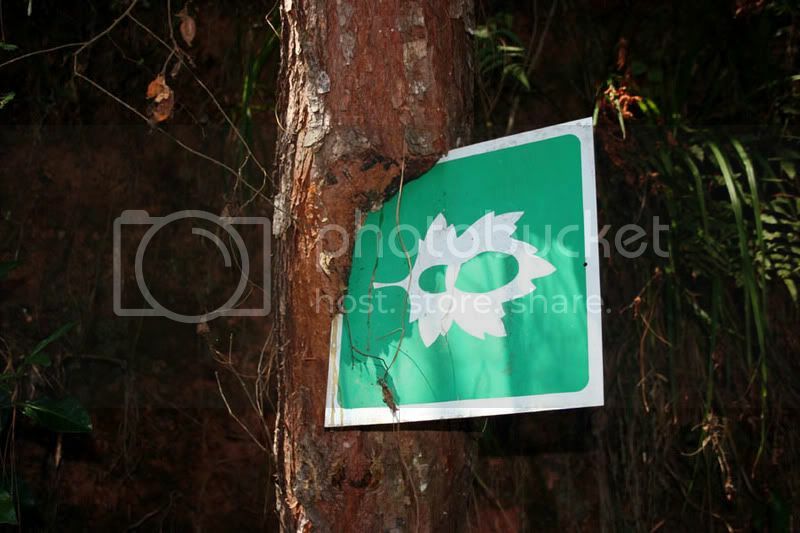 Amazing what some okes can do if they really short of bucks. Another 40 odd minutes see us arriving at Countess Services and a whole group awaiting and chatting about. Bob takes us on this nice little green lane and I nearly lose it in the first corner behind him trying to oustare a tree in the way of my turn. We are doing a decent speed down this lane and starting to settle in nicely by the end of it when we get to a small tar road. Look behind me and Anton is there but no Chris, Faantjie or Lootch :? After a few minutes I get worried that someone could of come off and turn around heading back slowly as I have seen pictures of guys going head to head not expecting some one coming the other way. Unfortenately the footpeg bolts came out somewhere and it could of been really nasty had Lootch not realised it in time. 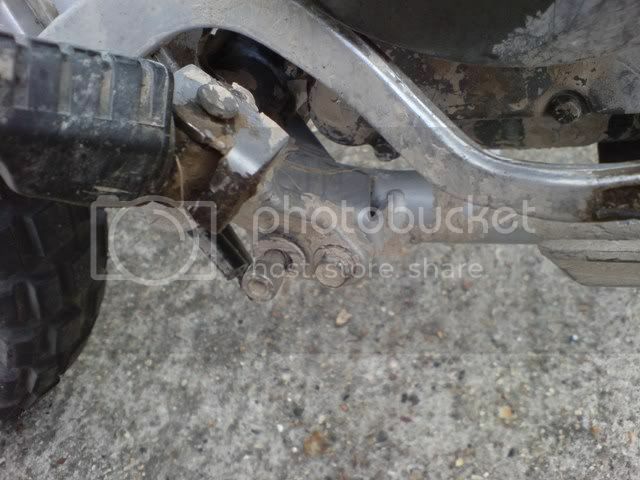 Offroad lesson #711 - keep spare bolts and nuts under the seat, I will from now on. Luckilly I have some long bolts fitted on my rear carrier holding the touratech frames in place and take them out, they not perfect but good enough to hold the pegs on taking a standard bolt from the other peg still intact. It is a simple thing but I have lost many nuts and bolts on bikes and it happens, so rather be prepared it is not that much extra weight carrying 10 bolts and nuts extra of different sizes. When Lootch hit a fair old pothole the rear wheel just broke the number plate right off. I turned around and fetch it as I knew this could be hard to explain going back to London and being stopped. Every time I go back to the plains seem to attract more and more mud, took me ages to clean yesterday and had to strip half the bike down. The next puddle I have sidestepped every time we have been at the plains as for it's size it just looked ominous. Chris asked how deep is it and said only one way to find out, we were like you first no you first and then I went down and by the time I hit the middle section the AT just came to a grinding halt. Took all the weight of the bike and managed to get it out with some throttle. This is all the photo's I took and was a great day out even with the odd breakdown which of course is the main ingredient for any adventure. Lootch I think the KLR has lots of potential and it is a steady workhorse which will perform flawless once we get all the nuts and bolts some loctite treatment. Faantjie well done for hitting the same puddle with your roadtyres and actually making it straight through without any hassle - full throttle dude! Awesome pics there, looks like lots of fun. By the way what helmet is that in the pic? I was looking at the samething Fun. This is the web site. It is the Marushin helmet made in Japan. Cost me Ã?Â£112 including two visors. Fibreglass helmet weighs 1550 grams and have all the safety stickers needed. More than ample airflow and very happy with the fit as it is nice and snug. How mutch for a Arai pippot in Rainland??? Mav!!!! What the hell happened to your hair?